Favorite's 'Nominate a Nurse' Contest is Back! | Favorite Healthcare Staffing Inc.
Do you know a nurse who has made an impact in your life? Do you want to honor a nurse for his or her dedication to the field? 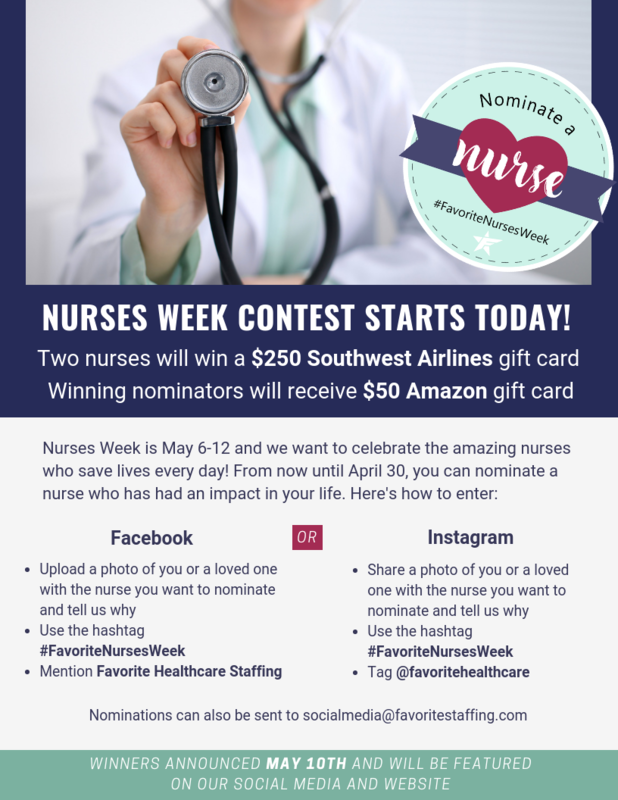 Favorite Healthcare Staffing will once again hold a social media contest for Nurses Week 2019! Nurses Week is celebrated every year on May 6-12 to recognize all nurses for their dedication, passion and kindness. Please help us honor nurses everywhere by sharing a photo of a nurse you would like to nominate and tell us why you think he or she should win. Check out our flyer below for more information on how to enter the contest or download the PDF version here. You and the nurse you nominate could win!